That dirty miser Old Man Winter is back with a chilled vengeance and he’s brought with him the bountiful gift of unnatural cravings for nothing but all kinds of uncomfortably hot soups, from butternut squash to caldo de res. At least in me he has. 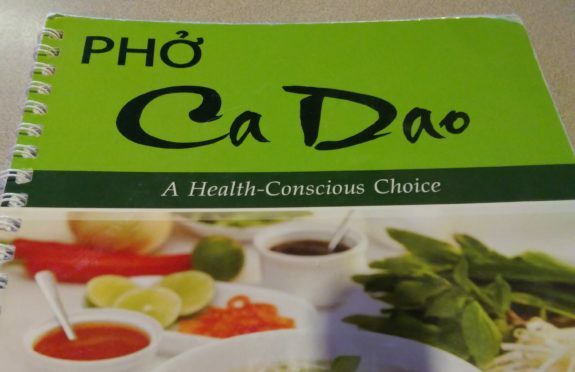 Thankfully, I don’t live too far at all from the Asian District and some of the best soups and stews in town, with my latest obsession being the advertised-as “health-conscious” selection over at Phở Ca Dao, 2431 N. Classen Blvd., in the mildly-historic Jade Asian shopping center, where I used to rent videos back in the nineties. But that’s another story, for another time. Filled now with fast-serviced dry cleaners, well-coiffed barbers and reasonably-priced jewelers, this small phở shop sticks out plaintively with its welcoming tables and chairs out in front, the welcoming lingering scent of simmering noodles, meat and vegetables constantly flowing through the double set of doors and gently into the surrounding air. My stomach tightens with a mixture of wild anticipation and mild hunger as I find my seat and the waitress unloads some water on me. 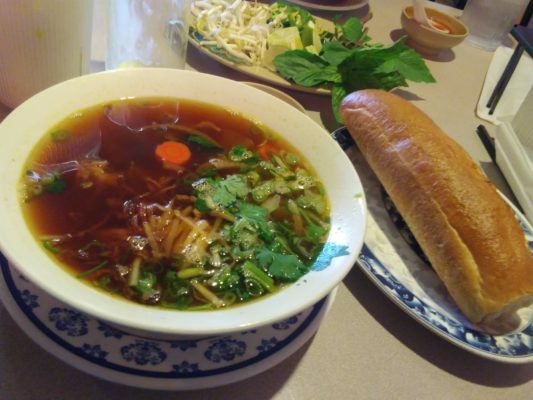 When I went a couple of weeks ago, I felt like trying something other than phở this season, giving in to the temptation of the Bò Kho ($9.00), Phở Ca Dao’s house special beef stew served with a small baguette to taste. 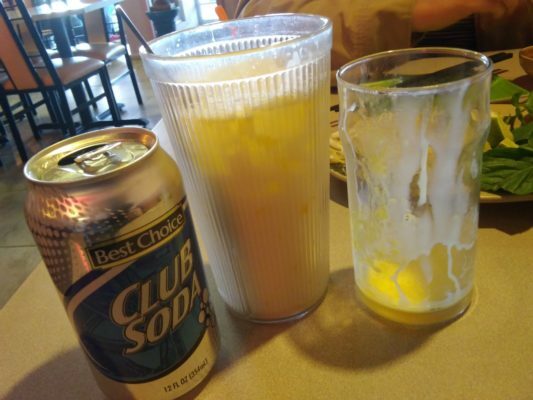 As I was waiting, the waitress brought me a Soda sữa hột gà ($4.00), or a club soda with a couple of egg yolks to effortlessly stir in and congeal over ice, which it did quite admirably. After sipping on that ovum miracle tonic for a few minutes, my grossly large bowl of Bò Kho came and with a quick sprinkling of basil leaves and bean sprouts, this hearty elixir worked its magic, warming the cockles of my heart like the elderly Asian grandmother I never had. The plentiful spicy slow-cooked brisket was tender and toothsome, with the swirl of things like carrots and cilantro adding some hefty girth to the already overflowing soup. The broth itself was pure magic, a winter curative if there ever was one. 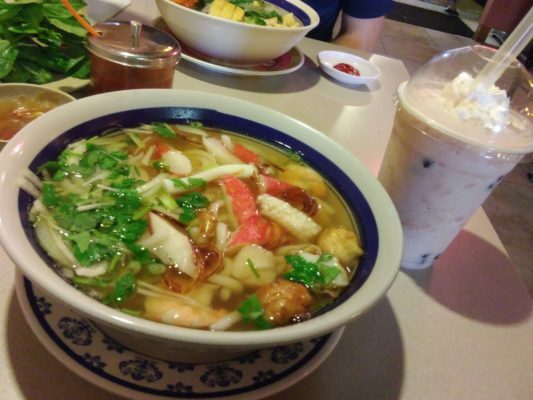 When I returned this past week for some more selfishly hot soup, with the dipping temps chilling my exposed skin—and believe me, as someone who usually refuses to wear a coat until it’s too late, there’s plenty—I was oddly seeking something with noodles and fish, thankfully finding refuge in the octopus’s garden that is the Bánh canh thập cẩm ($9.95) or, if you prefer, the udon noodle seafood house special. Greedily holding a rather exquisite Red Bean Bubble Tea ($3.50) in one hand, I stirred the Bánh canh thập cẩm around with the other one; the well-proportioned chunks of shrimp, mussels, squid, crab and, yes, fish balls, floated to the top, creating almost a small seafood buffet in a convenient bowl format. Squeezing some limes raw and dropping a few jalapenos in for a little heat, I carefully slurped the seafood delight, rolling the udon noodles on my soup-spoon like a pro. Serving nothing but overly large yet remarkably healthy portions, I was only able to finish half, practically filling a cup for another meal or two tomorrow; when enjoying soups or stews—Vietnamese or otherwise—plenty of leftovers should always be a standard to follow. 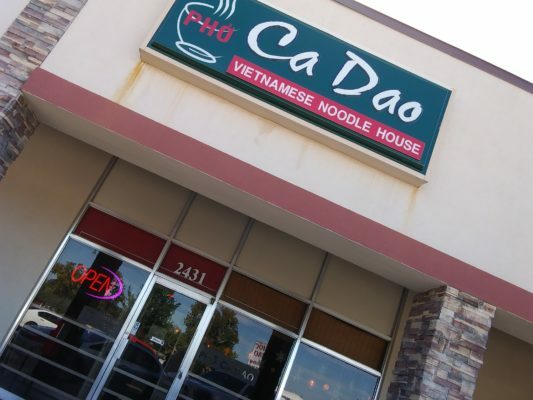 It’s just one of the many beautiful things that Phở Ca Dao does admirably, be it in the heated nethers of summer or the frigid bosom of winter. Cómpralo ya! Egg yolks in club soda? Can be sorta / kinda like eggnog. Usually sweetened with condensed milk besides the egg and club soda.